Customize your info on these really cute Baby Girl Pink and Gray Elephant Baby Shower Invitations, real Postage Stamps, Save the Date, and Thank you’s, all coordinated here! The amazing colors and your Personal TEXT create one-of-a-kind invitations and keepsakes that say it all! Get Ready for the Baby! Personalized Pink and Gray Elephant Baby Shower Invitations and More! Just imagine your Special Names Personalized on these cute Pink and Gray Elephant Baby Shower Invitations, Stamps, Save the Date postcards, and Thank you’s! 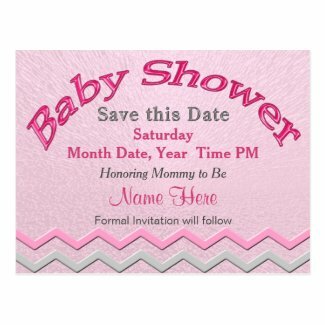 Pretty pink Baby Shower Save the Date coordinating Baby Girl Elephant Post Cards will give your guests a heads up It’s a Girl! 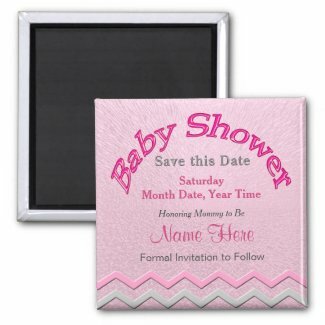 It’s easy to personalize these shimmering Sweet Pink and Gray Elephant Baby Shower Save the Date postcards at our customization shop at Zazzle. These Pink and Gray Elephant Baby Shower Invitations, Stamps, and Save the Date postcards for your baby shower are ready to start the show! The perfect party for that very special Pink and Gray Elephant Baby Shower Invitations. Call Linda for assistance personalizing or customizing at 239-949-9090 ~ please tell her Bev sent you! Customize Front View of Pink and Gray Elephant Baby Shower Invitations with your Text! Pink and Gray Elephant Baby Shower Invitations, Stamps, Save the Date, and Thank you’s, all coordinated here! The amazing colors and customization create a one-of-a-kind invitation that says it all! CLICK HERE to discover the amazing selection of Invitation paper available! made around the world, making your lifetime memories cherished for years to come! Customize Back View of the Pink and Gray Elephant Baby Shower Invitations with your Text! Zazzle’s offers Select, Artisan, Traditional, and Luxe collections ~ 12 premium styles in all! From fine linen to artisan felt to shimmers of champagne or pearl, and even metallic silver. You will find the perfect paper and have fun customizing your very own special Pink and Gray Elephant Baby Shower Invitations! Let the party begin! Add your own Text to the inside as well as the back side, and personalize the front of this Pink and Gray Elephant Baby Shower Invitation. A Production Of and the parents name on the back cover would be cute! This Pink and Gray Elephant Baby Shower Save the Date Magnet is a sweet way of honoring the parents to be. Grandmother’s will love this keepsake! Zazzle magnets are printed on 100 percent recycled paper and covered with scratch and UV-resistent Mylar. As always, there is no minimum order! Pick and choose from these delightful Pink and Gray Elephant Baby Shower Invitations, Stamps, Save the Date, and Thank you’s! 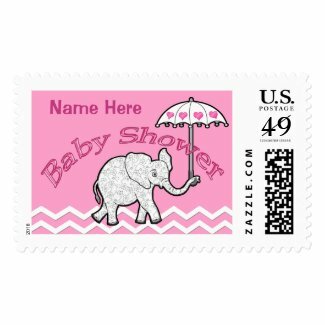 Baby Elephant Baby Shower U.S. Postage Stamps With Your TEXT! Customize this Baby Elephant Baby Shower stamp and create your own U.S. Postage stamp for your upcoming baby shower! What a greeting for your invited guests! This genuine postage stamp can be personalized to become a talked-about treasured keepsake! 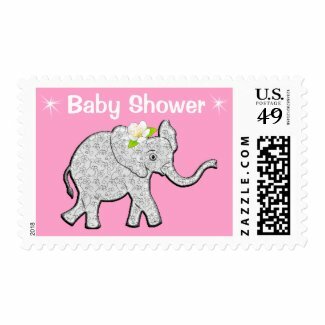 How to Customize your Real Pink and Gray Elephant Baby Shower Stamps ~ Yes, it’s real Postage! What is truly unique is that you can change the background color to an endless palette of colors ~ that’s right! You can change to a color of your choice, which even include bolder and masculine colors, as well as gorgeous hues of all colors! So in addition to having the choice of a Pink and Gray Elephant Baby Shower stamp, you can choose from a multitude; the choices are virtually unlimited! How sweet! Even Coordinating Cake Pops! Simply click the link above to go to the Baby Elephant Baby Shower stamp in our customization shop, and click the Customize It button. When it pops up with the options on the right-hand side, just look at all the choices under Printed Background Color ~ Click on the eye dropper ~ you will see an amazing variety! For even MORE choices simply click on Advanced for an infinite color scale. You can experiment to get just the look you want! Click on the Name Here button and type in the name you want, click Done. See how cool that looks! If you would like things a bit more bold, you can even use the neat color changer that pops up when you click on Name Here to change the color of her name. A great bonus is you can even change the font, just click on the F in the Edit and Customize Features. You have so many choices it will be hard to choose. Personally, I love the Amazone font, very elegant and easy to read. This is one of the more amazing things about Zazzle ~ Customization! You can experiment with the color backgrounds and find just the perfect one. You will really impress the Mommy to be, besides looking pretty sharp yourself with these Pink and Gray Elephant Baby Shower customized stamps! Plus, you can even choose a specific postage denomination from a postcard up to a bulk mailing. The stamps come in three different sizes. Check out these adorable Pink and Gray Elephant Baby Shower Stamps! You will know you are making the Baby Shower invitation a bit extra special with something they’ve never seen before! As always, the Zazzle printing is amazing, and you are definitely creating a very nice keepsake! Be sure to order the size that will fit. The smallest to mid size would work best for the postcards. These will look terrific with the customized save the date postcards! Very cool! Use the customization tools, as outlined above. If you would like to change the color bow on these Pink and Gray Elephant Baby Shower Invitations please call Linda at 239-949-9090. Please tell her Bev sent you! Gray Elephant Baby Shower Thank You Cards! Pink and Gray Elephant Baby Shower Thank you’s! Such a sweet note of thanks! Sparkling stars with set the tone for this cute baby girl elephant theme thank you card! Of course, as with all the Pink and Gray Elephant Baby Shower Invitations, it can be personalized with an endless palette of background colors! With the selection of colors, the elephant theme can even be used as a thank you card for any occasion. You can customize the wording, color, and choice of font. So cute with a teal color background, and yellow lettering! You can be creative in your choices! This baby elephant thank you card is certainly cute, sweet, and creative! Zazzle’s printing is far superior to other print shops, second to none. Their state of the art techniques gives assurance you are shopping for your loved ones and friends among folks you can trust! These Pink and Gray Elephant Baby Shower Invitations, Stamps, Save the Date and Pink and Gray Thank You Cards! Of course, Zazzle has a 100% “Love it” Guarantee or return it! Less than 1% of Zazzle’s merchandise is ever returned. Their clear robotic printing is unique and clearly makes them stand out among all other print shops! Their High Quality Standards and A+ BBB Rating create products that impress. 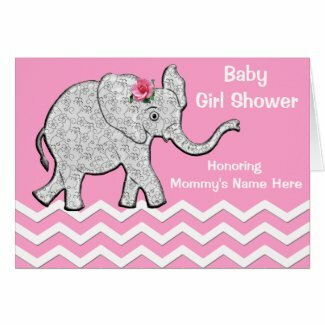 You will love your Pink and Gray Elephant Baby Shower cards and stamps or your money back, guaranteed! Check out all the amazing reviews! 4.8 percent of satisfied customers, pleased with the amazing colors and quality of printing, usually ahead of schedule. For excellent quality of custom printing orders, you will not find any better for any cheaper ~ or more fun to create, than right here, at Zazzle, in our friendly one stop shopping spot, where your orders will be customized and printed to your 100 percent satisfaction ~ guaranteed! For some really cool games to play try out The Baby Bump! You can even sign up to receive emails and receive weekly updates and ideas on your body and your baby! Thank you for stopping by our Pink and Gray Elephant Baby Shower Invitations, Stamps and other cute Pink and Grey Baby Elephant Baby Shower ideas. Give Linda a Call if you would like any of these designs in other colors or placed on other personalizable gifts from Zazzle’s quality and affordable personalized baby shower supplies, decorations and gifts. ‘Calling or Texting is BEST. If you do email, Please type CONTACT in Caps in the subject line.